If you’ve been on the iTunes homepage lately, you might have happened upon the Mayhem iTunes LP. I first heard about it through a friend but it got a lot of attention while it was featured on iTunes. This package is available only on iTunes 9 or later, and for only $1.99 it is insanely worth your money. If you search iTunes for “Mayhem” you’ll be directed towards an album called “Tyrese Gibson’s MAYHEM! (Comic Book and Single)”. Already your interest may be piqued but it’s even cooler than it sounds. You get the option to buy the album or the song on it’s own. The song “Mayhem Take Me Away (Logan de Gaulle Remix)” is a cool tie-in song, and whether or not you feel like Tyrese has a place in comics, you gotta admit the guy can sing. You can purchase the song for $.99 OR for $1.99, just a dollar more, you get a whole mess of digital goodies that is akin to DVD bonus features. After throwing caution to the wind and springing for the album I am glad to report all the features included in this purchase. As advertised you get Issue #1 of Tyrese Gibson’s “Mayhem.” I for one thought it was a solid read and really got a kick out of the exceptional gore rendered by series artist Tone Rodriguez. As an additional bonus you can play the comic as an audio comic. it’s similar to a motion comic in that there is voice over and sound effects (including the title character being voiced by Tyrese) but its unlike a motion comic because, well, it doesn’t move. 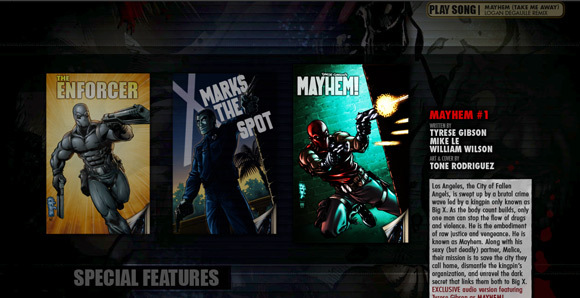 You do however get a enjoyable experience clicking from panel to panel and emerging yourself in the world of Mayhem. You can also turn off the word bubbles, but I have yet to catch the benefit of that other than a better view of the art, but that may just be my preference to read along. If I have one criticism of the flow of the comic it’s that you can’t click a button to play the whole thing through, you have to manually click to advance to the next panel(s). I may be wrong on this but if there is a way it is not easily apparent to the novice computer user. Of course you also get the song and I think it’s worth the $.99. Also included are two other digital comics. All of these comics are viewed in iTunes, and like the first these go through the story one or two panels at a time, although these do not feature an audio track. The first of the comics is called “The Enforcer”, it tells the story of a character that has a striking resemblance to Mayhem. We learn in the included notes that this was a previously published character, originally thought up by Will Wilson and Tone Rodriguez, that was later tweaked and became Mayhem thanks to the creative input of Tyrese Gibson and Mike Le. The other bonus comic is titled “X marks the Spot” delves briefly into the past of Big X, the crime boss we come to know in the main series as Mayhem’s enemy. Both of these provide a insight that develops these characters in a more profound way, allowing us to get more attached to characters appearing (for the time being) only in a mini-series. As if all that wasn’t enough there is a Special Features section. In the special features you get to see a pinup gallery which includes alternate covers, concept art, and miscellaneous pretty’s that are Mayhem related. You also get a number of downloadable wallpapers which are available in a few sizes tosuit your screen. 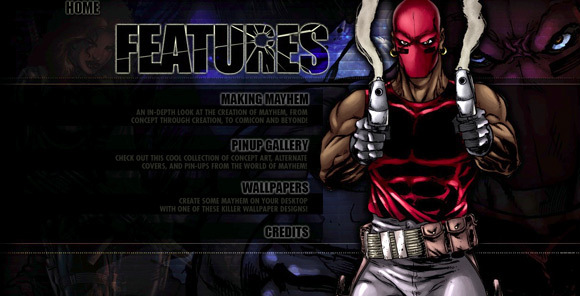 Lastly, and maybe most impressively, you get a “Making Mayhem” video, which includes an in depth look at the comic from conception on, and has commentary from Tyrese, as well as Tone Rodriguez and Jim Lee, who take you through in some detail their art process. My favorite part might be Tyrese smiling like a kid meeting Superman when Jim Lee is drawing Mayhem, it’s really rather endearing. So what else is there to say, I really liked this ridiculously in depth tour of the world of Mayhem and at the price it’s going for I would recommend everyone downloading it, if only for the unique comic experience it presents.